My birthday was a week ago now buuut, I kind of wanted to share the beauty bits I got. So first of all, my lovely friend Chloe got me quite the bundle of beauty bits and bobs! So lets start with what she kindly picked up for me. The first thing was the Natural Collection Blush in Dusky Pink. I haven’t bought anything from Natural Collection in a very long time but I was so happy with this. Dusky pink shades are my absolute favourite and this blush is no exception. It looks very pretty lightly dusted over the apples of my cheeks. Secondly, was the NYX Illuminator in Enigmatic. Being the NYX obsessive I am, I was intregued when I unwrapped this. Its a beautiful light pink highlighter/illuminator that just looks so natural and beautiful on the cheek bones. Then onto the No7 Matte Lip Crayon in Raspberry Wine. This is such a me colour. I can’t really explain the colour, its just kind of a browny/red/pink shade but its just so pretty and I’m so impressed with this! It feels so comfortable on the lips and isn’t drying at all. Lastly was the Collection Lasting Perfection Concealer. I used to use this concealer all the time but then swapped it for a different one and I’ve forgotten how good it is. Can’t go wrong with this! That was quite the ramble haha, but thank you to the wonderful Chloe for all those lovely things. Now onto the two eyeshadow palettes. First up is the Morphe 35OS palette. I’ve got a whole post coming up soon on this so I won’t say too much, other than the fact its INCREDIBLE. Second up is the Too Faced Chocolate Bar Palette. My wonderful friends got me this as a surprise and I was so flipping happy about it. I already own the Semi-Sweet palette so this is so nice to add to my collection. The smell is also pretty incredible as you’ll know, and all the shadows are so pigmented and buttery. 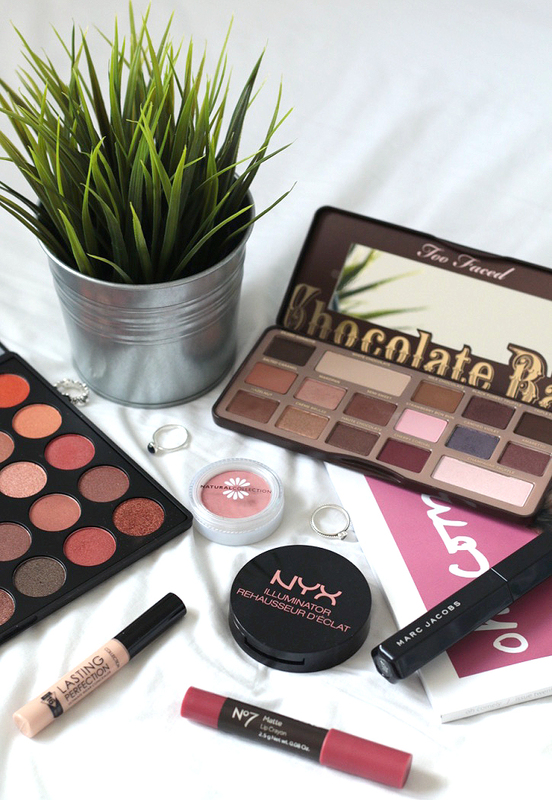 Love love love this palette. Last but by no means least was the Marc Jacobs Velvet Noir Mascara. I’d heard so many amazing things about this mascara and just knew I had to get my hands on it, without splashing out £20 myself. I’ve tried this a few times and do really like it. Its not as impressive as I expected for the price and brand, but nonetheless its still fab. It does a fantastic job of separating the lashes and giving them a good amount of volume. It does lose the curl as the day goes on but that could just be my lashes, who knows. All in all, its a good little mascara.